This casserole is sooooooo good! 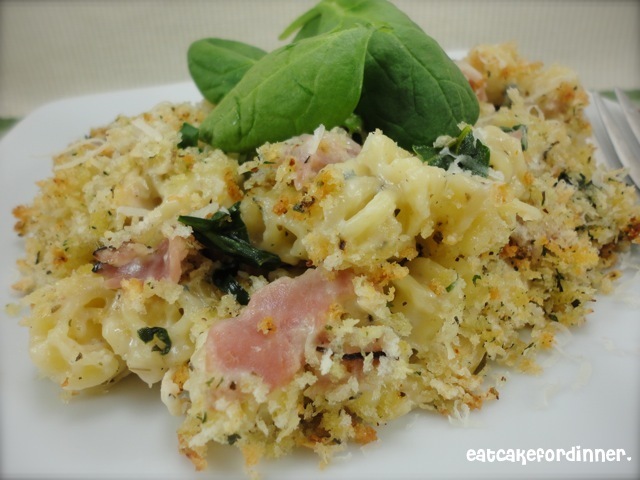 It is loaded with ham and chicken and it is rich and creamy and cheesy with a great crunch from the Panko bread crumbs. Not to mention, it is full of healthy spinach! Like I said - so good! I sent the recipe home with one of my co-workers and she tried it this past weekend and her family loved it too! 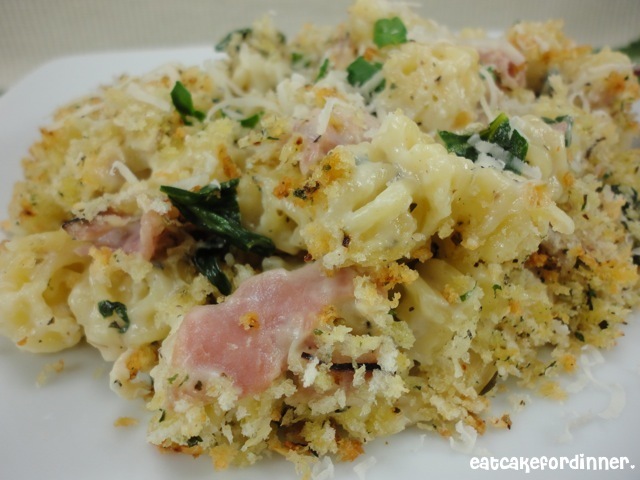 It might seem like a lot of ingredients, but it comes together pretty quick and since it is a casserole, you can just throw everything in the casserole dish, bake and enjoy! I know you will love this one and I think it will be a frequent menu item! Preheat oven to 350 degrees. Heat 2 Tbl. extra virgin olive oil in a large skillet. Add the garlic and saute for about 30 seconds. Add the spinach and saute a few minutes or until it's wilted. Add the chopped ham and shredded chicken and toss to coat with spinach and garlic. Cook about one minute and then remove from skillet and set aside. To the same, now empty, skillet add 3 Tbl. butter and cook until melted. Whisk in the flour until a thick paste forms. Slowly whisk in the milk and cook until thickened. Season with salt, pepper and Italian seasoning. Then, stir in the Italian cheese and Gorgonzola and stir until cheese is melted. Taste and adjust seasoning as needed. Stir in the spinach mixture and cooked pasta. Stir until everything is coated with sauce and pour into a 2-quart casserole dish. Combine bread crumbs, dried parsley, Johnny's Garlic Spread, salt, pepper and grated Parmesan cheese. Sprinkle over the top of casserole. Spray top lightly with either cooking spray or butter spray. Bake, uncovered, for 15-20 minutes or until top is golden brown. Serves 4-6. Jenn's Notes: You can use seasoned bread crumbs instead of using the Panko and other seasonings, but I love the crunch the Panko adds. This was a hit and we had it on the dinner table from start to finish in less than an hour. This sounds like a really kid friendly dish. Thanks for sharing it on foodie friday. Oooohhh sounds so darn good, actually wish it was sitting in front of me right now. I'll be giving it a try. Thanks for sharing your creative inspiration over at Sunday's Best! Oh wow! We tried this dish tonight here at Chez Nelson...major thumbs up all around! Thank you!